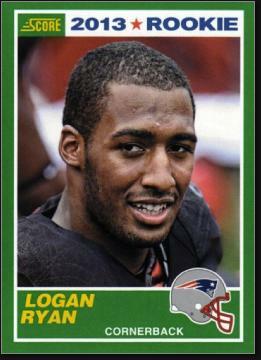 Logan Ryan was born February 9, 1991 in Berlin. Growing up on the edge of the Pine Barrens in southeastern Camden County, he spent a lot of time outdoors as a boy and developed into a superb athlete. Logan played quarterback in youth football and continued his development as a passer for Eastern High in Voorhees. He played cornerback on defense for the Vikings and was an All-State selection at both CB and QB. College recruiters projected Logan as a four-star defensive back, and he accepted a scholarship to Rutgers. Logan started a handful of games as a freshman in 2010 for the Scarlet Knights, who finished last in the Big East under Greg Schiano. The following year, he picked off 3 passes, returning one for a touchdown, and was named 2nd Team All Big East. He was an important part of a turnaround 9–4 season. Logan’s third year on the varsity—under new coach Kyle Flood—saw him intercept four passes and rank among the conference leaders with 59 solo tackles. He was named 1st Team All Big East, and earned All-America honors from Pro Football Weekly. The Scarlet Knights won the Big East title. Logan decided to go pro and was drafted in the third round by the New England Patriots. He started 13 games in his first two seasons, and scored his first NFL touchdown as a rookie with a 79-yard interception return against the Jets. He had a pair of sacks that year against the Dolphins and two INTs against the Ravens in the final game of the 2013 season. In 2014, he teamed with All-Pro Darrelle Revis to help the Pats win the AFC title and Super Bowl XLIX. Logan became New England’s first-string right cornerback after Revis left and Tarell Brown was injured in 2015. He intercepted 4 passes and logged 58 tackles and was arguably their best pass defender. The Patriots went 12–4 but fell to the Denver Broncos in the AFC Championship. Logan was flagged for a pass interference call on Demaryius Thomas, which extended Denver’s opening TD drive. In the teams’ previous meeting, Logan’s coverage of the star receiver received high marks. Logan’s work in the secondary with DB Duron Harmon was a big reason the Pats made it to the AFC title game in a season where there was considerable upheaval in Bill Belichick’s secondary. They had played together at Rutgers and were reunited when New England drafted them back-to-back in 2013.